Standardization is a commonly misunderstood term in the healthcare industry. It has been defined as the process by which healthcare products and services are chosen by a committee of key stakeholders, considering evidence-based results, to ensure quality patient care while adhering to fiscal responsibility. However, standardization can mean different things to different people. For hospital administrator’s standardization represents efficiency. It helps decrease variation which increases quality and safety while reducing costs. From a healthcare manager’s perspective, standardization helps foster an environment of quality patient care. It limits the risk for errors and improves patient safety. For physicians, standardization can mean something entirely different. It is often viewed negatively and as a means of control. Many physicians are not comfortable adopting standardization unless there is demonstrated evidence it benefits patient outcomes. Nurses, on the other hand, believe standardization is about cost savings, efficiency, and patient safety. They see standardization as a time-saver. The less time they spend searching for the proper medical equipment, the more time they can spend with the patient. Subsequently, patients believe that standardization is for their benefit, but they are typically more focused on the manner they are treated rather than the methods used to treat them. Many critics of standardized care call it “cookie-cutter medicine”, and a “one-size-fits-all” approach to treating patients. Those critics often favor personalization or a more personalized approach to medicine. They embrace the concept that each patient should be treated as unique individuals. The word personalization can also mean different things to different people. Many assume personalization to be genetics and personalized medicine with customized drugs and medical devices. However, personalization can simply mean making each patient feel like an individual, rather than “one of the masses”. 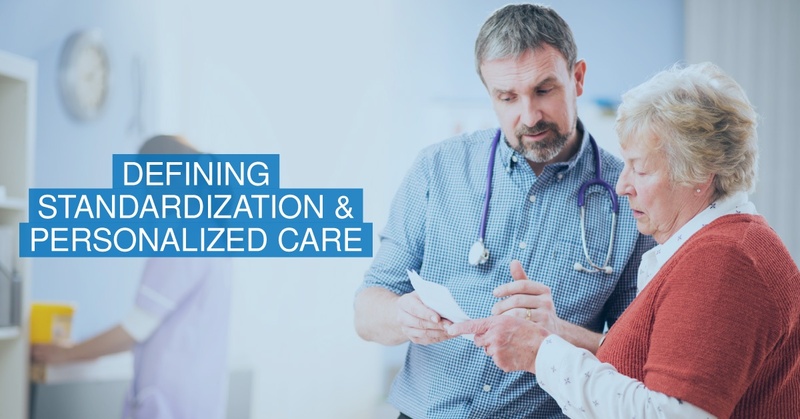 As the value-based care movement makes its transition, these varying perceptions of standardization and personalized care will likely take new shape. While standardization of protocols, surgical checklists, clinical pathways, and treatment regimens are necessary for evidence-based practices, it is also important not to standardize the patient experience. Successful organizations will partner with physicians to reduce costs while improving quality of care and patient safety. They will understand how to standardize and personalize patient care at the same time. Together they will implement standardization and personalization that complements one another so that patients do not feel like they are subject to a “one-size-fits-all” “standard” care experience.